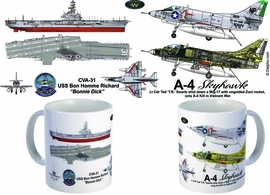 A-4 Skyhawk Cutaway as flown by Lt. Cdr Ted "T.R." Swartz of VA-76 from the USS Bon Homme Richard (CVA-31) during the Vietnam War. On May 1, 1967, he shot down a MiG-17 with an unguided Zuni rocket to claim the A-4's only air-to-air kill during the Vietnam War. One side is the external and cutaway view of the A-4 at the moment the plane is about to be trapped on a carrier. The gear, flaps, slats, and hook are down. 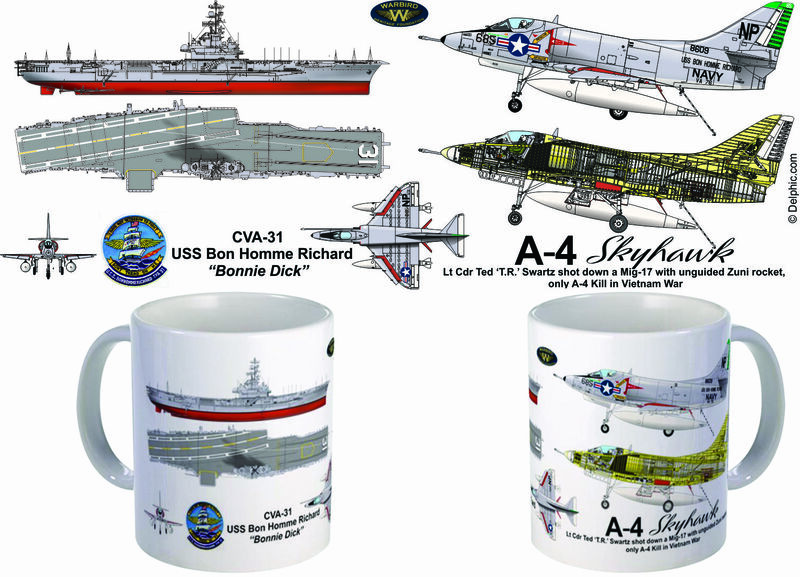 The other side features the aircraft carrier that the A-4 landed on, USS Bon Homme Richard (CVA-31) with A-4 top and front views. You can see a flying A-4 Skyhawk with Lt Cdr Swartz's markings at the Warbird Heritage Foundation (http://www.warbirdheritagefoundation.org)in Illinios.